How Does p16 Play a Major Role in Cancer Research? Figure 1. IHC staining performed on Leica Bond III platform using Enzo’s p16 mAb. p16 is a tumor suppressor protein that plays an important role in cell cycle regulation. It is now being used as a biomarker for a number of cancers. Since its discovery, p16 has become highly significant in cancer research. Dr. Manuel Serrano and colleagues from Dr. David Beach’s lab conducted yeast two-hybrid screens in search of proteins that interact with human cyclin-dependent kinase 4 (CDK4). Their screens led to finding a cDNA gene that encoded for a polypeptide of 148 amino acids, with a molecular weight of approximately 16kDa, characterized for negatively modulating kinase activity of CDK4 ; this marked the initial discovery of p16. Soon after, Dr. Alexander Kamb’s lab investigated the entire genomic structure of human p16 and found the full-sized gene to be composed of 3 exons, encoding for a slightly larger polypeptide sequence of 156 amino acids and 15.8 kD . Serrano and colleagues wound up initially discovering a shortened/truncated version of the p16 gene. p16Ink4a, also known as Cyclin-dependent Kinase Inhibitor 2a (CDKN2A), Cyclin-Dependent Kinase 4 Inhibitor A (CDK4I) or Multiple Tumor Suppressor 1 (MTS-1)), is a tumor suppressor protein that is encoded by cell cycle regulatory gene p16 or CDKN2A on Chromosome 9p21. p16 or CDKN2A gene is responsible for producing 2 major cell cycle regulatory proteins, p16 and p14(ARF), which both serve to negatively regulate the p16-Rb-E2F pathway and p53 pathways, at the cell cycle transition from G1 to S[11, 12]. The CDKN2A protein p16 acts to negatively regulate CDK4 and 6 by interacting with its binding domains and inhibiting the ability of CDK4 and 6 to interact with cyclin D[1,9]. Normal progression through the cell cycle starts when the cell receives a physiological cue that becomes a mitogenic signal which initiates the transition from an inactive, quiescent G0 state to the first growth phase (G1) of the cell cycle. Soon after the mitogenic signal is received, D-type cyclin expression increases[5,6,8]. These D-type cyclins then interact with CDK4 and 6 to activate its catalytic domain and induce kinase activity[5,6,8]. Once CDK4 and 6 have been induced, this results in subsequent downstream phosphorylation of tumor suppressor protein retinoblastoma protein (Rb) and related pocket proteins p107(RBL1), and p130(RBL2)[5,6,8]. As Rb is progressively phosphorylated by CDK4 and 6 in response to D-type cyclin production, this process initiates a phosphorylation-mediated disruption of Rb function that causes Rb to dissociate from E2F1, where Rb is bound, thus encouraging E2F transcription and the progression from G1 to S[5,6,8]. When the cell is not progressing through the cell cycle or is in early G1, Rb is present as an hypophosphorylated multiprotein complex bound to the E2F family of transcription factors which can recruit co-repressors to collectively repress the transcription of target genes by E2Fs[6,7,10]. E2F target genes are significant because they encode for proteins involved in DNA replication (MCM2-7, CDC6) and cell cycle control (CCDNE, CDC25A)[7,10]. By p16 negatively regulating the kinase activities of CDK4 and 6, the presence of hypophosphorylated Rb increases, arresting the cell cycle by inhibiting E2F-mediated transcription until the cell is ready to progress into the next phase. The ratio of D-type cyclins to p16 provides for a fine-tuned regulatory mechanism to oversee Rb phosphorylation which allows for appropriate transition from G1 to S of the cell cycle. Before p16’s initial discovery, cytogenetic abnormalities of chromosome 9p21 region were previously implicated in a wide variety of human cancer types such as gliomas, melanomas, lung cancers, etc. Using the results of a previous YAC and p1 chromosomal walk as a road-map, researchers set up sequence tagged sites (STSs) for homozygous deletions in melanoma cell lines, using the frequency of deletions to estimate the location of the deleted region of 9p21. Chromosomal deletions accumulated near cosmid c5 and the sequences were determined and then compared in GenBank. Two distinct regions were found to have sequence overlap to recently discovered p16. Around this time, Kamb et al., and Nobori et al., collectively observed a high frequency of p16 deletions in cell lines derived from tumors of lung, breast, brain, bone, skin, bladder, kidney, ovary and lymphocytes[2,3]. Researchers have since described the silencing of p16 functionality by additional means such as methylation of the promoter and point mutation as well. Lukas et al., studied wildtype p16 cell cycle arrest in healthy, diploid cells against cell cycle arrest of tumor-associated mutants of p16 to further clarify p16’s growing role in tumorigenesis. Ultimately, this led to uncovering that normal diploid cells that arrest cell cycle progression by p16 are induced late in G1, whereas p16 mutants did not stop G1-S transition at all. This suggested loss of p16, overexpression of D-Cyclins and loss of retinoblastoma all share similar effects in deregulating the cell cycle and allowing for inappropriate transition from G1 to S.
p16’s functional roles in the transition from G1 to S, its structure, mechanisms of action, expression patterns, and protein-protein interactions have been extensively studied and is currently considered a major biomarker for the continual research of cancer mechanisms across tissue-types. The absence or diminished expression and/or functionality of p16 has been implicated in literature as a defining characteristic of tumorigenesis. Meanwhile, the overexpression of p16 has demonstrated profound cell cycle arrest. However, the overexpression of p16 present in tumors has led to a need for further clarifying the initiation of oncogene-induced cellular senescence in malignancies. Enzo Life Sciences offers a comprehensive Cancer Research portfolio. At Enzo, we believe in providing scientists with novel tools that will help support cancer discovery into the next decade, and beyond. We have our SCREEN-WELL® Cancer Library, a collection of 275 compounds that can be used for screening and assay development. Furthermore, our portfolio also includes kits, antibodies and proteins including p16 mAb (Ready-to-Use), PD-1 , PDL-1, and MEGACD40L® to aid your research. Our growing list of over 1000 IHC validated antibodies includes those for the detection of key signaling proteins, cell surface markers, mediators of cell death, oxidative stress, heat shock proteins, proteasomes, and more. We know IHC optimization can be a time and resource consuming endeavor. You can back any of our antibodies with our Worry-Free Antibody Trial Program, even those not validated for IHC. Please check out our Cancer and Immunology platforms for more information or contact our Technical Support Team for further assistance. 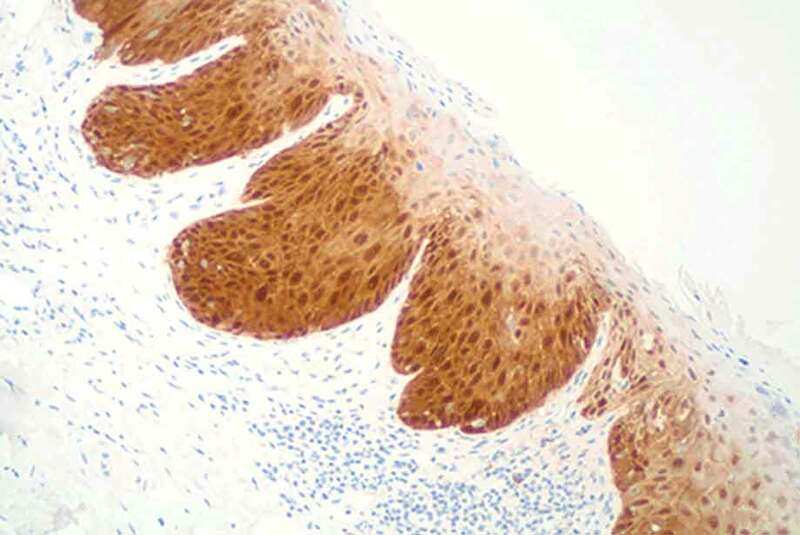 High definition IHC chromogen producing brilliant blue color for AP-activated development.